In 2016 Doorbraak activist Jennifer van Leijen initiated a campaign to stop the Dutch government from subsidizing blackface (Zwarte Piet or Black Pete) on children’s television. More than 12.000 people already signed. Van Leijen regularly writes updates. Here is number 18 (also read numbers 1, 2, 3, 4, 5, 6/7, 8, 9, 10, 11, 12, 13, 14, 15, 16 and 17). Good news! The European Parliament has considered admissible the same complaint about the Dutch government’s subsidy of racist television aimed at schoolchildren. There will be a preliminary investigation of the facts by the European Commission. The matter has also been referred to the Committee on Culture and Education and the Committee on Civil Liberties, Justice and Home Affairs, the European Parliament’s anti-racism and diversity intergroup and to the EU High Level Group on combating racism, xenophobia and other forms of intolerance, for information. Please support this important petition number 0017/2018. Today I contacted Arie Slob, in writing, and informed him about our petition against the government subsidy of racist children’s television. I also informed him that the European government is investigating this via a citizens petition. The majority of such petitions is declared inadmissible, which means that we are already being taken seriously. The Dutch government, however, have actively ignored and thwarted the attempts of anti-racism activists to be heard about this issue, that is, the Dutch government do NOT take this issue seriously. 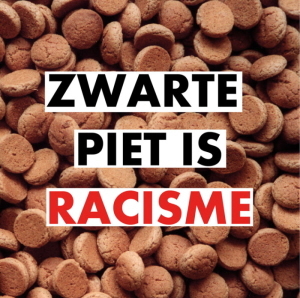 Prime minister Mark Rutte went so far as to make an advertisement for his political party claiming that celebrating this tradition is not racist. When asked during the Nuclear Security Summit about the blackface caricature Rutte admitted unashamedly that he had personally taken part in blackfacing. That’s why the letter informing Arie Slob of the petitions was short and to the point. In the last few years, the Children’s Ombudsman, the Netherlands Institute of Human Rights, and the United Nations have all condemned this specific form of discrimination. The government can’t plead ignorance to the fact that they subsidise this discrimination in various ways. For example the government request that police wear blackface as part of their work. And many volunteers who dress in blackface have free liability insurance during their blackface activity, paid for by the government (it’s called the VNG vrijwilligersverzekering). The European Parliament is also investigating a petition about the Dutch police wearing blackface (petition number 0022/2018). Amnesty International has also complained about anti-racism activists being wrongly arrested by the police (this effectively blocks the protestors right to peaceful protest against discrimination). In the Netherlands, it’s easier to find work if you are white with a criminal record for violence, than if you’re black and without a criminal record. Everything that contributes to racist stereotyping in society prevents people being seen as individuals in their own right, and being treated fairly. It’s wrong that the Dutch government actively subsidises this inequity.